I was building on Reaction Grid and in need of a script so I looked at the map, located a couple of green dots and teleported over to request help. Techplex Engineer, an Anime-haired avatar greeted me cordially and immediately guided me to exactly what I was seeking. 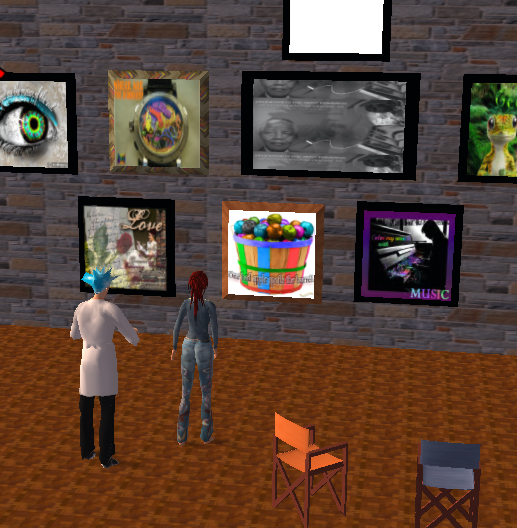 Curious about the surroundings of the sim I had never seen, I inquired about the project and the blue haired Avi told me he was teaching teachers as part of a Summer Institute Outreach Program at the University of Maine’s School of Education. The name of the Course was “Creating An Immersive Virtual Learning Environment“. Part of the project from the Summer Academy was a World Religions Plaza for use with high school students. My interest piqued, I continued to ask questions, finding my new virtual friend to be knowledgable and adept at explaining. He provided pertinent web-sites, information about getting my mossy path to look seamless, and demonstrated layering of prims for particular effects. Techplex explained that the teachers in the course were learning to build and use this environment to become “a new breed and begin to integrate this type of learning into their classrooms and to transform the classroom into a more stimulating and exciting way to learn”. He was the co-instructor and “thankfully” not responsible for grading. As is common in virtual environments, we exchanged ideas, discussed strategies and shared resources. The chance encounter was worthwhile, helpful, and meaningful to me as a veteran teacher. My new virtual colleague is a recent High School graduate on his way to the University this fall to major in electrical engineering.